Lespri Penthouse for Your Next Park City Vacation! This residence offers the finest in luxury lodging accommodations in Park City and its unique architectural elements and creature comforts are suitable for the most discerning traveler. A Beautifully appointed “urban meets mountain contemporary” palette sets the stage for your stay, as this space is adorned with the latest in fashionable finishes and fine detail. A multimedia of architectural textures including rustic brick wall accents, linear stone work, hand scraped wood and custom granite, are found throughout the residence, creating reminiscence of a New York loft space, yet with an idyllic snowcapped Rocky Mountain backdrop, in the heart of Park City’s downtown district. The opposing living space offers an comfortable family recreation area. With comparable 80 inch flat screen, ample luxury seating, and adjacent full bath, the living space also doubles as an additional sleeping area, with a thoughtfully designed Queen murphy bed hidden in the custom wall unit shelving area. There is one additional queen murphy bed in the home, allowing for a lodging total of 8 guests. Daily housekeeping is included during a stay at this luxury condo. Catering, bartending services, spa services and various other pairings can be built into a lodging stay at this location. 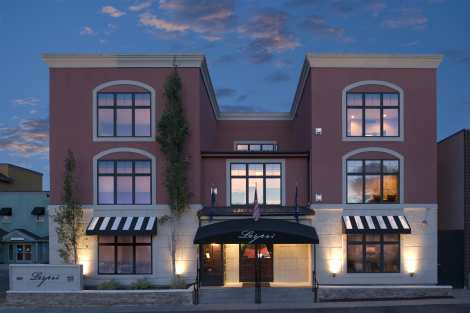 Take advantage of this freshly remodelled, fashionable luxury townhome in the heart of the downtown area, as you plan your next getaway to Park City.